Communal Foraging Behavior and Recruitment Communication in Gloveria sp. The caterpillars of Gloveria sp. mark trails with a pheromone they deposit by dragging the ventral surface of the tip of the abdomen along branch pathways as they move between their communal nest and distance feeding sites. The threshold sensitivity of the caterpillar for an extract prepared from the secretory site was approximately 0.5 × 10−3 caterpillar equivalents/cm of trail. 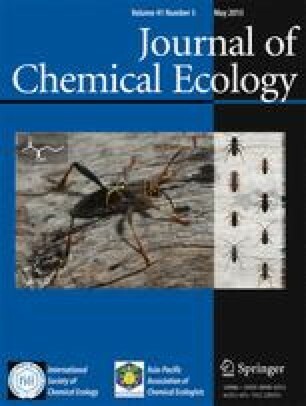 Bioassays show that Gloveria follows neither authentic trails of Malacosoma americanum nor artificial trails prepared from 5β-cholestane-3-one, a chemical previously reported to elicit trail following from other social caterpillars. Although our observations show that fed caterpillars mark heavily as they return to their nest, we found no evidence that individual caterpillars are able to recruit hungry nestmates to new food finds. In this species, recruitment to food occurs only after many caterpillars have reinforced a trail to a newly discovered food source. In contrast, hungry caterpillars of the confamilial species M. americanum, tested under identical conditions, responded strongly to the postprandial trails of individual caterpillars and rapidly abandoned depleted sites in favor of new food finds. We postulate that the difference in the efficiency with which these two species recruit nestmates to food evolved in response to differences in the spatial distribution of their food supplies.